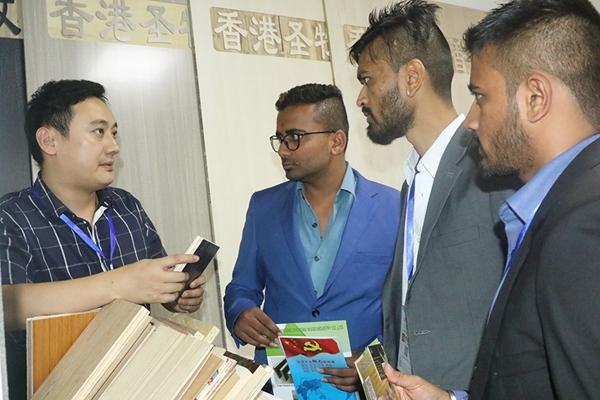 The 9th China (Linyi) International Trade and Logistics Fair turned into a bonanza for a group of African and Chinese business people at a business expo in East China's Shandong province. "Our Kenya team ordered 60 20-foot shipping containers of building materials and commodities and signed several letters of intent for the procurement of other products at the fair", said Liu Zongguo, general secretary of Kenya Shandong Chamber of Commerce, who led 16 Kenyan purchasers and exhibitors to the fair, which was held Sept 22 to 25 in Linyi, East China's Shandong province. According to Zhan Dong, vice chairman of the Kenya Chinese Chamber of Commerce, the most popular goods from Africa are wine, black wood sculptures, coffee and tea. Zhan also is chairman of the Kenya Shandong Chamber of Commerce and runs a large-scale supermarket in the China Center of Nairobi, focusing on exporting Chinese commodities to Kenya, and vice versa. "Generally speaking, Chinese consumers are not quite familiar with African products. Actually, there are a lot of goods in Africa that can meet the requirement of consumption upgrade in China, such as some health goods made of moringa seeds. I believe, when the Chinese buyers know more about African products, they will buy more," said Zhan. Liu, who is at the same time the general manager of Kingnor Company Ltd, agreed with the CEO of the China Center Supermarket. "The potential of the trade volume between China and Kenya and Africa at large is very big," Liu said. This year marks the second time that businesspeople from Kenya have teamed up as a delegation to participate in the annual Linyi event. Compared to last year, the number of Kenya team members was down by 10 people, but the quantity of the goods they bought increased by 5 percent, which keeps the same momentum with the general intentional trade volume of the three-day trade gala. 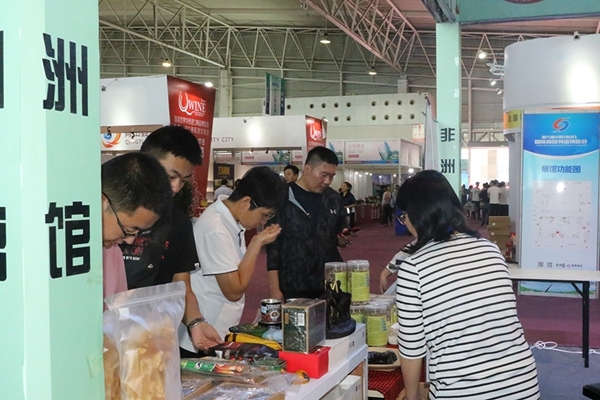 According to Li Zongtao, director of the Administrative Committee of Linyi Trade City, which is the main wholesale dealer and one of the organizers of the fair, the general intentional trade volume is 1.74 billion yuan ($253.02 million), which saw a 6.5% increase compared to last year. "The real estate industry is blooming in Kenya, while building materials in Linyi are abundant and the prices are very competitive. We should intensify our business cooperation and expand to other areas," said Tarang Mukesh Kara, who operates a trading company in Nairobi dealing with materials. 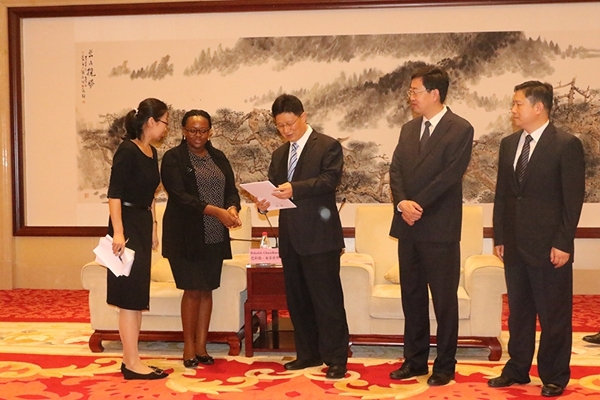 Tarang's comments were echoed by Lilian Ndanu Kioko, the investment promotion officer of the Kenya Investment Authority, in a meeting with Linyi Mayor Meng Qingbin. She spoke of Kenya's investment policy and sent an invitation to the host to invest in Kenya. She promised to provide one-stop service to help foreign investors, including business people from Linyi, to solve the problems of company registration, work permit application and tax declaration. "We hope the business cooperation between China and Kenya can go beyond trade and include investment, which will bring more benefit to both nations," Kioko said. Meanwhile, Linyi has accelerated its speed of overseas expansion. According to the mayor, in line with the Belt and Road Initiative, the city has set up nine overseas trade cities and overseas warehouses in countries like Hungary, Pakistan, Germany and Saudi Arabia in recent years. They also plan to open Kenya Linyi Trade City in Nairobi next month, a move that is warmly welcomed and highly expected by both Chinese and Kenyan business people, such as Zhan and Tarang. "The Nairobi trade city project will definitively benefit both Chinese and Kenyans in terms of not only trade, but also people’s mutual understanding, which in return will lay a stable foundation for further cooperation," Zhan said.